Pop punk perfection… that’s All Time Low in a nutshell! ​Not many bands can lay claim to consistently selling out shows whenever they tour Australia, but All Time Low can proudly wear that badge. They’ve repeatedly topped the charts, sold over 1.5 million albums worldwide, chalked up 100+ million views on YouTube, have 5+ million social media followers, and have sold out London’s Wembley Arena. They are a bona fide worldwide sensation and they’re kicking off a whole new chapter in 2017. With well-earned recognition for their success, All Time Low have won two AP Awards and two Kerrang! Awards, landed the title of Best Pop Punk Band at the Top in Rock Awards, and were named Band of the Year by Alternative Press Magazine. There is already massive buzz around the highly anticipated new single (due early February) - tickets from and brand new album not long after, so it is with absolute sheer pleasure that we can announce All Time Low will be touring Australia in May 2017, for six epic headline dates! 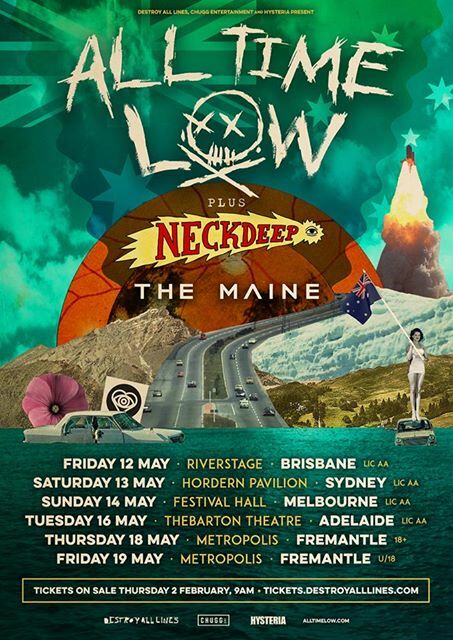 This isn’t just any ordinary tour either... All Time Low will be bringing along Neck Deep and The Maine in a massive triple-head extravaganza, when they play their biggest ever Australian shows! The Maine are Arizona's alternative pop punk darlings, and aren’t afraid to redefine their sound as they continue to push musical boundaries. Their new album, Lovely, Little, Lonely, will be released in April and if the new single Bad Behaviour is anything to go by, this will be another instant classic. As Alternative Press notes, "The Maine sound like a band who've finally found their happy place”. All Time Low have succeeded where so many have failed; in bringing back the glory days of pop punk. With a string of sold out signs being prepared as we speak, you have been warned, so get in early to nab your tickets!